We have had a few cold snaps already, and I’ve noticed a sharp decline in the number of insects around. So when my son and I were pulling up some vines the other day, you can image our surprise when a swarm of yellowjackets came up from the ground. We took off running as fast as we could, and fortunately no one was stung. But it made me wonder – what do those yellowjackets do all winter? 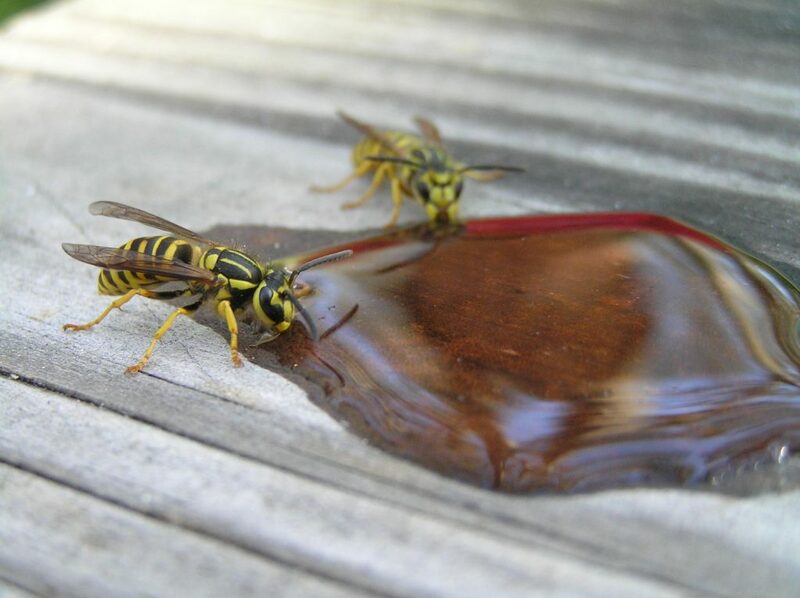 Yellowjackets are a type of wasp. They live in colonies that include workers, queens, and males (also called drones). 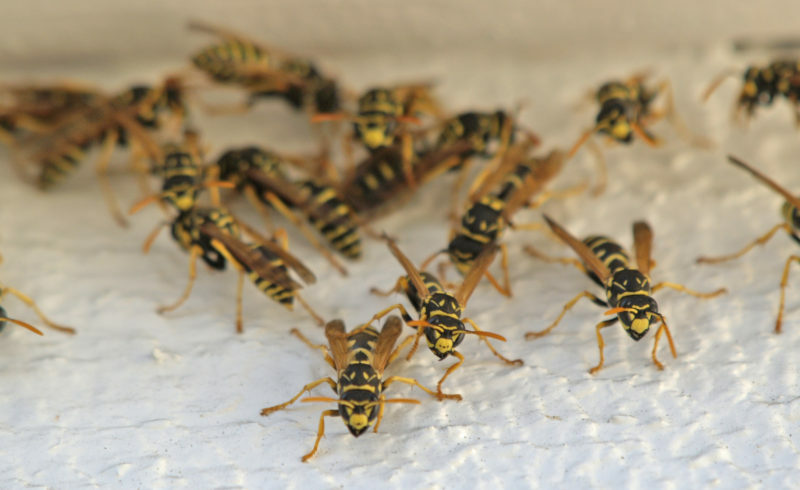 A worker yellowjacket is about ½ inch long and has black and yellow bands on its abdomen. 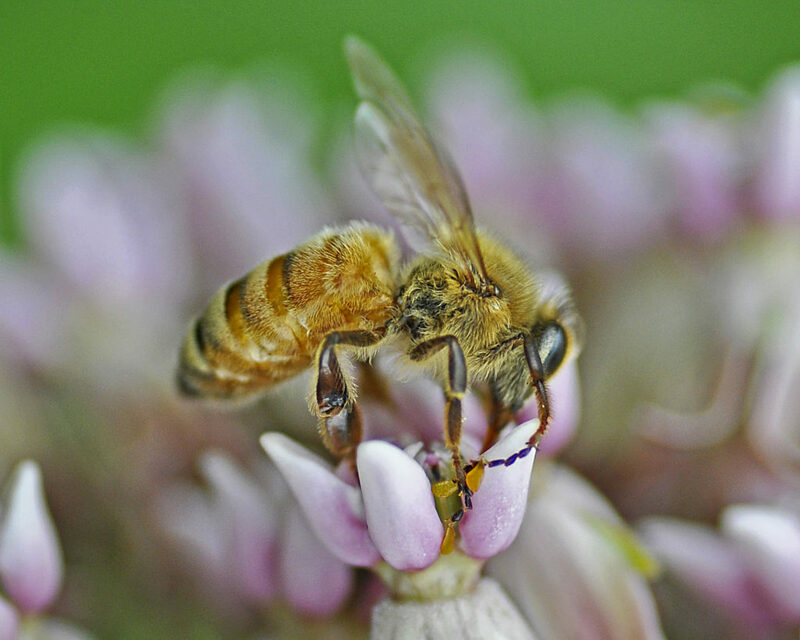 Although its color is similar to that of a honeybee, yellowjackets have shiny, smooth bodies, while honeybees are covered in hair. Unlike honeybees, which spend the winter as a colony, most yellowjackets do not survive the winter. Only a queen that has mated will hibernate and live until spring. The workers, drones, and old queen die when the temperature becomes cold. In our area, that is around November. The new queen will find a place to hide for the winter, such as a hollow log, loose bark, firewood, leaf litter, or soil cavity. She will stay there until the temperatures start to warm up again in April or early May, when she’ll come out again and start searching for a new nesting site. At first, the queen builds a small paper nest where she lays her eggs. The eggs hatch, and the queen feeds the larvae for about 18-20 days. The larvae pupate and come out as worker-daughters. They search for food, gather wood fibers to expand the nest, take care of the queen and the new larvae, and defend the colony. The queen’s job is now just to lay eggs, and the colony grows quickly. By August and September, the colony may have as many as 4,000 t0 5,000 workers! It’s late November, and the workers were still defending the nest we disturbed. We’ll wait until the weather gets colder, then try to finish the job. Who would have guessed winter would be the perfect time to do some yardwork? “Yellowjackets.” Ohio State University Extension. “Yellowjackets and Hornets.” University of Florida.